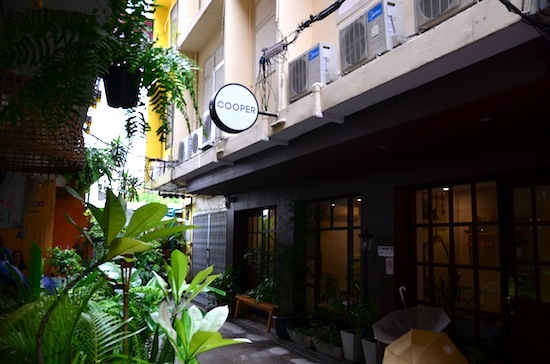 At the end of an alley just off Silom Road, the charming Cooper Hostel opened in late 2014 to offer a range of rooms for under 1,000 baht a night. 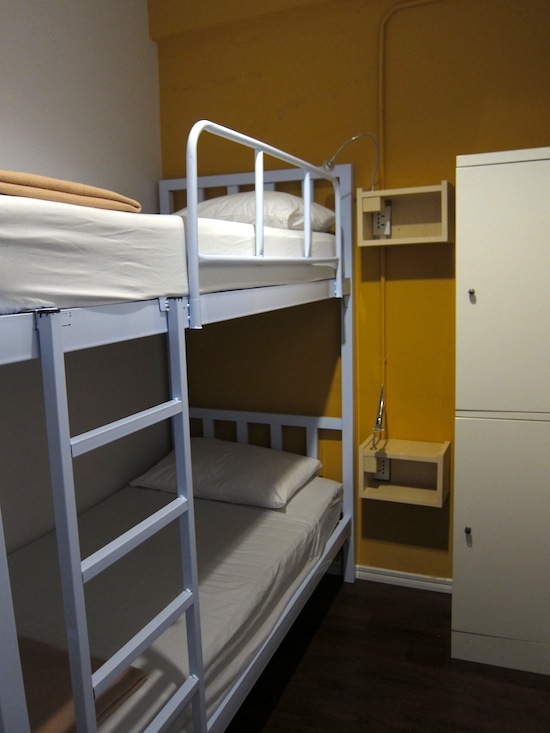 Perhaps better described as a guesthouse due to the limited dorm options, it’s an especially good choice for backpackers seeking an affordable private room with a homely vibe and helpful staff. Ad Book now! Rates from US$22.69++. Average rating 8.9 from 40 reviews. 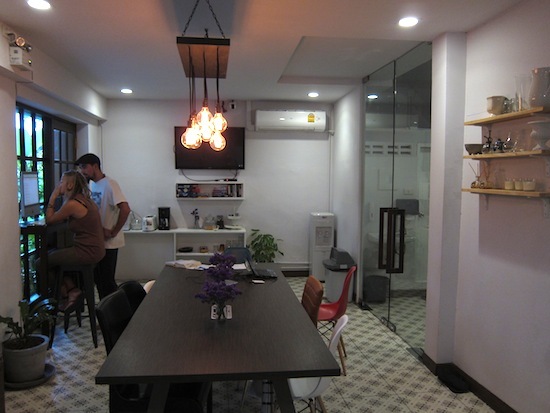 The hostel’s unassuming frontage gives way to a minimalist design in the air-conditioned ground-floor hangout area, where guests can sit around a large table and chat, switch on the LCD TV or tune into Travelfish using a shared iMac desktop or free WiFi. The manager who showed us around — a younger woman by the name of May — had a great attitude and laid-back demeanour. She spoke excellent English while explaining all of the accommodation options off the top of her head. Stairs lead up to a few different room types on the upper three floors, each equipped with clean shared hot-water bathrooms divided into male and female. A bright four-bed mixed dorm has two white-steel bunkbeds on either side of the room, with good-size lockers in between. Each bunk comes with a thin but reasonably comfy mattress, private reading lamp and electrical outlet. A private double with shared bathroom. Pairs of travellers on a tight budget can grab one of the small but adequate private rooms with two bunks, lockers, private reading lamps and use of the shared bathrooms. Those with a bit more cash to spend might opt for a similar room but with private bathroom and the choice of one double bed or two bunks. Note that some of the private rooms do not have windows, while others come with a large window; there’s no difference in price so request a window if possible. Would be lovely when the rain stops. 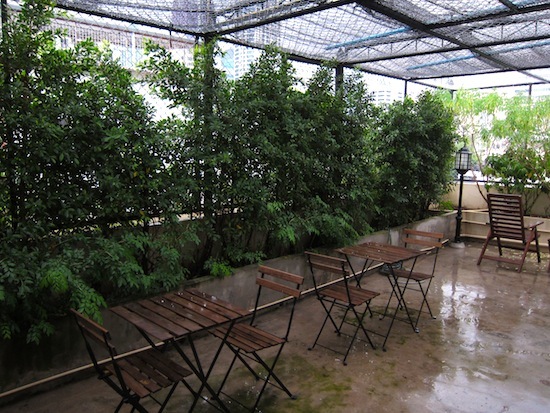 Cooper is a homely spot to relax in rather than a party hostel, but you will find an inviting rooftop garden area with a few tables — perfect for a few beers and a round of cards after dark. The location down a tiny side lane off Pan Road puts you within a five-minute walk of Silom Road, Kathmandu Gallery, Sri Maha Marriaman Hindu temple, Neilson Hays Library and the abundant street food of Silom Soi 20. The nearest Chao Phraya express boat pier is about 15 minutes away on foot; on the way there you’ll pass another huge selection of street food and art galleries on and around Charoen Krung Road. Surasak and Chong Nonsi BTS stations are both only a 10- to 15-minute walk away. This is also a strategic location if you intend to pick up a Burma visa, and a large Southern Indian community ensures that vegetarians will be in good hands. One of three hostels in this tiny alley. Check out Saphai Pae or Lub d if you’re after a larger hostel with more of a party scene and more common areas. Directly across the lane from Cooper are PanPan Hostel and Two of a Kind Hostel, both similarly intimate options. There’s also Zhongdee Hostel at the end of its own side lane on the other side of Pan Road, and the cheaper/larger but less-welcoming Mile Map Hostel closer to the Hindu temple. All of these are fine choices; we preferred Cooper mostly due to the staff. If you don’t mind a more out-of-the-way location in exchange for more breathing room, FAB Hostel and New Road Guest House are also worth considering.